Hi, welcome to my counselor online. I’m Cassie, and this is asking for a friend that’s where you submit your questions and then I tracked down one of our awesome counselors to answer your questions. And today I have Josh for live with me to answer questions submitted by Bob from Houston. Josh, thanks for meeting with me today. 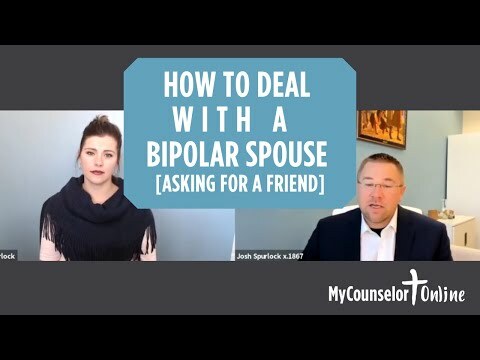 How does or should you deal with a spouse that has mild bipolar or cyclothymia. Once or twice a year, there seemed to be extreme highs that he can’t even talk to his wife about without her thinking he’s against her, or he doesn’t care about her once it’s declining she feels like she’s just a bit.Like she’s been off more than she can chew. This gentleman’s friend is really confused as to what you shouldn’t do to help even out the highs and the lows. He says they aren’t as bad as full blown bipolar, but they are lifestyle affecting So Josh, take it away. Yeah, this is one of those situations, like many situations of dynamics, where the family member, the person who’s in a seeking out help is not necessarily the person who, as the struggle. That God hasn’t given you the ability or the responsibility to control the other person, even if that is a for their best interests in your mind. That we’re just not given that by God. And so we have to respect the limited autonomy that God has given to individuals in our life. Individually, the situation to do is a have your own support network in structure because you’re going to need people who you can bring in the circle with you and process the difficulty of what it is you’re facing. But you’re not going to be able to get through this in a healthy way. If you don’t have some support. And so rather than be in the form of professional counselor or just a close mature friend that can keep confidence. You need some individuals in your life from you can bring the struggle to process it out loud and bounce ideas off of in terms of how to handle the situation so that you’re not alone in that struggle. For most people, to be challenged, especially around a mental health issue to take action is really scary and uncomfortable and really requires a depth of relationship and closeness. And if there’s if there’s not a strong relationship there then it just feels like criticism. It feels like attack and is likely to result in a real defensiveness on the part of the other person. And so I’d encourage you to get your own support as well as focus on the development of the relationship that hopefully enables you to be able to communicate the impact on you. Continue in close relationships. So we need more distance until they choose to address those things. Those are tough decisions to make. And oftentimes, having a counselor that you can talk those things through with to determine what’s the best course of action in the specifics of your situation can be very helpful. Friend has you as a resource, and I’m sure that’s very helpful to him. If you are watching this and you would like one of our awesome counselors to answer a question for you. You can submit that question on our Asking for a friend page just go to my counselor. online and search for Asking for a friend, it’ll pop up and then I will track down counselor and get them answer that question for you. And you can look for the answer on our weekly e newsletter.